From foie gras to boeuf bourguignon, and all kinds of delicious pastries in between, France is world-renowned for its delicious food. It is after all, the county that coined the term ‘Haute Cuisine.’ Producing over eight billion bottles of wine a year­–from Champagne and fifteen other wine regions–France is also home to some of the world’s best wines. Study up on our guide to French food and wine, and on your next Azamara voyage to France, you’ll dine like a rois (king). In Part One, we’ll explore the incredible food and wine of Northern France. Along the northern coast of France sit the regions of Brittany and Normandy. Both cuisines feature bountiful arrays of fresh seafood including langoustines, plump oysters and more. 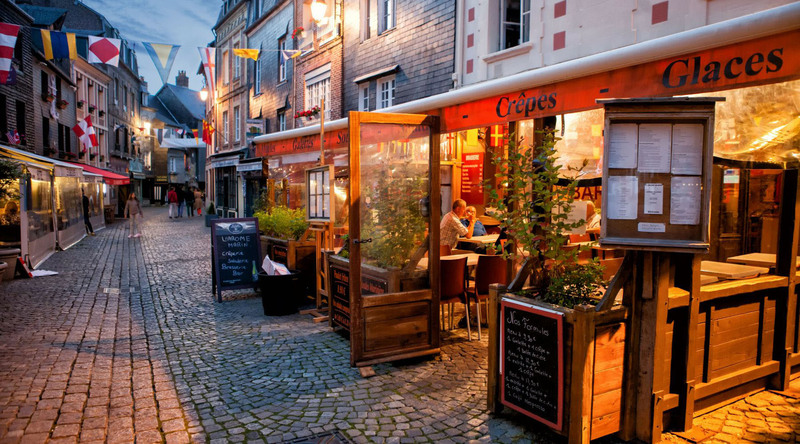 The next time you find yourself in Honfleur, St. Malo or Lorient, look for the following dishes and drinks. Camembert: This is a soft and creamy cow’s milk cheese from Normandy. Delicious at room temperature, it also becomes wonderfully soft when melted. Cider: While most of France is known for its grapes, the north is famous for another fruit–apples. That’s why instead of wine, cider is produced here. Apples are fermented to produce a delicious and slightly fizzy cider drink. Just like wine, you can find both dry and sweet types of cider. Normandy is also known for Calvados, a strong apple brandy. Try a tipple as a digestive. Crêpes: Brittany is home to some of the best crêpes in the world. In France, savory crêpes are called galettes and are made with buckwheat, a grain grown in the region. Ham and cheese is a classic filling, but the galettes can also feature eggs, seafood, or vegetables. For dessert, sweet crêpes are made with flour. Popular fillings include lemon and sugar, Nutella and there’s the classic Crêpes Suzette, where the crepes are flambéed in a caramelized sauce of sugar, orange juice and orange liquor. Far Breton: A dense, flan-based cake from Brittany that’s studded with prunes. Moules Marinières: In this classic dish from Brittany, fresh-from-the-sea mussels are gently steamed in a mixture of garlic, shallots, leeks, cider or white wine and sometimes a little mayonnaise. Neighboring Normandy has a similar dish, moules a la Normande, where instead of mayonnaise, double or heavy cream is added, making the dish extra luxurious. With either version, crusty baguette to sop up the delicious sauce is a must. Kougin-Amann: This delicious dessert is made from yeasted dough folded with lots of butter and sugar to bake a dense yet flaky pastry that’s wonderfully caramelized from all of the sugar. Oysters: You either love or hate these briny mollusks. For those who love them, Brittany is an oyster mecca, producing over 60,000 pounds of the delicacy every year. They are best enjoyed raw, with a squeeze of lemon and a splash of mignonette sauce. For the freshest and tastiest oysters, enjoy them in season–any month with an “r” in it (September–April). Sables: From Sablé-sur-Sarthe in Normandy, sables are the French version of shortbreads. Delicious and buttery, these round cookies have a crumbly and sandy texture. Pot-au-Feu: One of the ultimate comfort food dishes for the French, pot-au-feu is a hearty French beef stew, where cheap cuts of beef are braised for a long time with root vegetables. After a day exploring the D-Day beaches near Cherbourg, this is the perfect meal to way to end the day. Fleur de Sel­: Salt may not be a French food per se, but we couldn’t mention northern France without mentioning this prized sea salt. Harvested by hand from marsh basins this salt has a unique shape and the taste is said to linger longer providing additional flavor, making it a great finishing salt. Fleur de sel makes a great souvenir to keep in your kitchen, or bring to loved ones. Sole Meunière: Whole sole (preferably Dover sole) is pan-fried in lots butter and finished with lemon and parsley. When served at a restaurant, it’s deboned for you, tableside. Upon arriving in Rouen, Julia Child’s first taste of French food was sole meunière, and it sparked her lifelong love affair with the country’s cuisine. Order this dish on your next visit to France, and perhaps it will work its magic on you too. If you’re ready to say “oui” to a journey to northern France, our Tall Sails and Remembrance Voyage in 2019 with stops in Honfleur, St. Malo, Paris (Rouen) and more, is the perfect itinerary for you. For more travel inspiration, read our guide to spending 36 hours in Paris.